"I dream about having a playground — a real playground, a fun playground — in our neighborhood. But all we have is an empty lot down the street from my apartment." When a little girl sees a man measuring the empty lot, she’s sure that he’s there to help make her playground dream come true. And he is! Inspired by the real story of the first-ever playground build by KaBOOM!, here is the story of how a determined young girl, with the help of her family, friends and community, makes her dream playground in her own neighborhood a reality. "This book may inspire more than dreams," notes Kirkus Reviews. 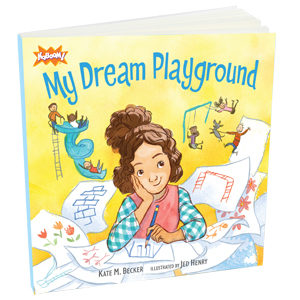 Written by Kate Becker, VP of Program Management at KaBOOM!, the book's spirited prose is brought to life by illustrator Jed Henry's "charmingly childlike" pictures (Kirkus Reviews). Sadly, like the girl depicted in this book, all too many children lack access to a safe place to play. They will learn that with spirit and resolve, they too can make their playground dreams come true. Get your copy today at Amazon or from your local bookstore.